Last week the missionaries came and dug up the seven-by-seven foot garden spot on the south side. (There is only ten feet between the exterior wall of the house and the fence, so that just leaves enough room to walk through.) They spaded it and turned it over with two bags of compost so that it can sit and marinate for a couple of weeks, and be ready for planting. This was the spot that was first dug up two years ago when we first moved in. 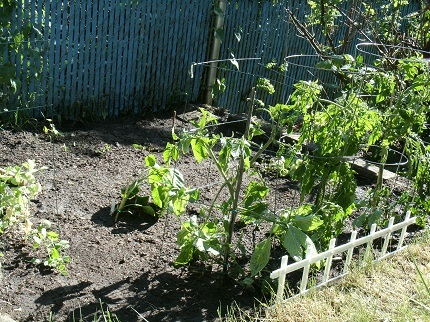 I had found this square space marked out for whatever previous purpose by concrete and cinder blocks, and earmarked it for snow peas, tomatoes and zucchini even if we didn’t do much more that that. Our little garden space the first year. There’s a walkway between that little piece and the back corner of the lot on the street side. I had ambitions last year, for our second growing season. Those potatoes choked out the beets next to them, so I wanted to separate the potatoes and put them across the way, and try some winter squash. The back yard had grass about two-thirds of the side-to-side length, and the third of it that ran to the side street was a dense, choked mass of bluebells. I aimed to get rid of them; we had an elder who really enjoyed getting out there with a shovel, and he and his companion agreed to come back for a second stint of digging for me; they had already come and spaded out the original square section on the side a couple of weeks before. As the bluebell graveyard, as I called it, grew so did the pile of strange items that they found under the surface in the dirt. There was an old rake head, so rusted that just looking at it could give you tetanus. There was an equally rusted circle of something, a shopping cart wheel, a plumbing cap of some type, jar lids, and several twisted colored wire constructions that made me wonder if they were some year’s equivalent to a cat’s cradle game. There were also almost twenty bricks, most of them whole, which randomly turned up as the elders went along. They lined some of them up as a boundary, just to have something to do with them. I have set apart a second section with the rest. 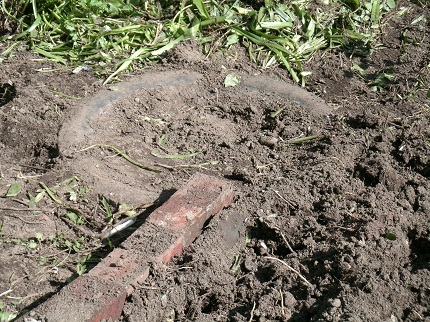 There was a tire buried in the dirt, and I agreed that it wasn’t worth the work to dig it out. I wondered if it was the bottom of an erstwhile pile of tires to grow potatoes, but there was no way to know. They ran the brick line over to it. I used it as a squash hill last year, and will build it up for that purpose again. I wonder how many years that sat there. Keep in mind that all of this was under a layer of dirt and bluebells. 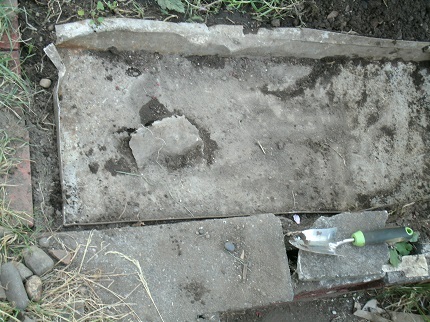 The strangest thing I found myself, a lightweight metal tray carefully fitted against the inside corner of the retaining wall, with a heavy concrete block on one end, and four inches of dirt packed on top. It was outside of the bluebells area, under the grass. This explained why we couldn’t get a shovel into the corner where we wanted to put a rhubarb plant. There have been so many odd things here that we had not investigated further than the slight “klang” of metal, but simply moved the rhubarb over. When I did get it dug up I was baffled. I have no idea what its purpose could have been. 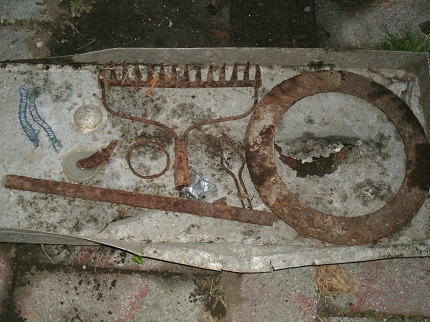 I have no idea why someone buried this tray in the yard. On the other end of the shallow back yard, there was a line of concrete set into the north edge, reaching into the corner. A friend helped dig it up, and we made a tulip bed. I planted it last fall, and loved the richly colored flowers that came up this spring. There was patchy grass showing some kind of brick or cement surface. I had to work on that last year in very small pieces, but I was determined to find out what was there. I didn’t know if it was a small flat surface for a planter, or a whole patio, or what. 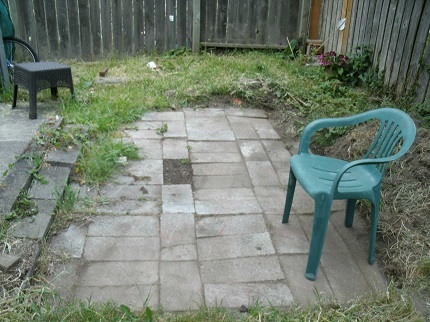 It took me a month to uncover; on one end it was clear that dirt had blown over it and grass and weeds had caught hold in a thin layer, but on the other end the drop was four inches from the grass to the pavers when I had it cut out. It was indeed a patio of sorts, made of twelve-by-eighteen inch pavers, and totaling six by ten feet. A younger soul with a good back could have made short work of it, I’m sure, but this wasn’t something that was going to feed us like a garden, and I didn’t feel right asking the elders back for a third round. It was lovely on hot evenings last summer to be able to go outside with our dinner and sit with a breeze in the shadow of the house. The back yard is on the east, so by the time the sun is hot and in the west, our little patio space had light shade. There is no air conditioning in this place, so this option was something we enjoyed. It did have a raised block set into one corner — another quirk — just right for a pot of daffodils, so even though it was too cold to go sit out this spring, it delighted the eyes. This exploration and excavation process is a lot like finding the gospel. We have a quirky property here, which had been neglected for a long time. In much the same way we are unique individuals and we all need work to become what we should be. We couldn’t do everything at once. Just stepping outside and looking at the state of the grounds was discouraging, and our energy had to be spent on getting moved in. We created a small garden space that first season where one had clearly once been set apart, its concrete perimeter established but its interior left to the mercy of the elements, overgrown with weeds. This was the only section that was still clearly discernible. Even it had a cement edge along the side nearest the house that we didn’t realize was there that first year, until we dug again to prepare for another planting. Every piece that we have made useful was grass-covered, though not full and lush, and mowed right over. Its potential was not readily visible, but it was there. You can see the irregular darker line, the water-stained area on the left was all that visible. Turns out that one of the middle pavers was missing. The clean-up wasn’t quite finished yet — I lost the final picture. The things that had to be removed could be likened to habits that need to be left behind. The rusty, useless implements might be grudges that must be rooted out, or feelings that must be healed; the buried tray might be patterns that are no longer useful and must be discarded. The soil underneath it was long-untouched and rich. Our purposes change when God becomes a part of them. The shopping cart wheel is only part of something bigger, and not useful unless it is fitted to the larger conveyance. The fullness of the restored gospel is the perfect vehicle, whole and entire, to carry us where we need to go. Someone else may have made different choices as to how to reawaken this little piece of the world, and that’s all right. I left a border of bluebells across the back because my husband wanted them. I had to dig out a lot of supposedly-gone bluebells this month where they didn’t belong anymore, and that’s typical of life as well. Some tasks have to be done over and over so that problems that once beset us don’t take over our lives again. It wasn’t nearly as hard this year; they had come up again but they weren’t as entrenched. We all have weaknesses that we continue to work on. I am prepared to plant more this year than the last, and that was more than the first. This year’s project is more kinds of squash and vertical supports for them, because somehow the dimensions of the ground didn’t get any bigger. My growing plans are growing greater. The key is that we don’t have to work on them alone. Whatever it is that we struggle with, our Father in Heaven understands and works with us. Our Savior knows and walks the road with us, and the garden spaces of our lives will grow. I have spent some of my space and effort for blooming things that gladden my heart, and some for vegetables, to feed my spirit and my body, and I am happy digging up dirt to do both.